Hey my friends what are you posting for Sepia Scenes today? This very tall crane decorates the development my SIL lives in. Cranes are large, long-legged and long-necked birds of the order Gruiformes, and family Gruidae. There are fifteen species. Unlike the similar-looking but unrelated herons, cranes fly with necks outstretched, not pulled back. Cranes live on all continents except Antarctica and South America. Most species of cranes are at least threatened, if not critically endangered, within their range. The plight of the Whooping Cranes of North America inspired some of the first US legislation to protect endangered species. Thousand Origami Cranes (千羽鶴, Senbazuru or Zenbazuru) is a group of one thousand origami paper cranes held together by strings. The Thousand Origami Cranes has become a symbol of world peace through the story of Sadako Sasaki, a Japanese girl who tried to stave off her death from leukemia as a result of radiation from the atomic bombing of Hiroshima during World War II by making one thousand origami cranes, having folded only 644 before her death, and that her friends completed and buried them all with her. Her story is told in the book Sadako and the Thousand Paper Cranes. Hope you enjoyed the information about paper cranes. I have made them often to give to friends and members of my classes. Please sign Mr. Linky and leave a comment. I love comments! And don't forget to visit other participants. Wow! That's an interesting shot! Beautiful statue of the bird! I have a post this time! Beautiful picture! The history was wonderful. And Sadoko and the 1000 paper cranes was a book that really left an impression on me as a child. My best friend when I was in 4th grad got Lukemia. We made her 1000 paper cranes, and unlike in the book we did reach our goal and she is still cancer free to this day. Thank you for the kind memories today! The crane stands tall, his long legs allowing a style of elegance, and with those huge wings, is as graceful in flight, too. 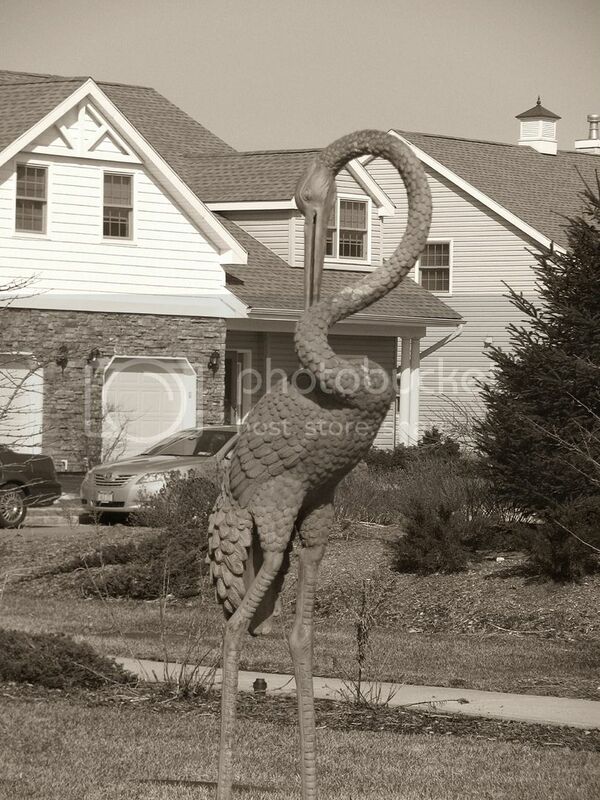 Nice sepia avian! I love that story--see Heidi's comments. Folding cranes for our little friend brought the story to life for us. What an interesting post filled with great links about cranes. Neat shot too! "n Asia, it is commonly said that folding 1000 paper origami cranes makes a person's wish come true." That's pretty true, mostly given to those really sick. I love cranes! They are so graceful and mysterious. Thanks for letting me link to your blogging party today. First time to do so! Now I'm over to check out some of the other participants. Your color-selective shamrock is just perfect, Mary! I love the crane too, and your post. It's A Blog Eat Blog World I have one of my favorite lighthouses in the world, Little Sable. On the west coast of Michigan, Little Sable (pronounced saw-BULL) is one of the most picturesque beacons of the Great Lakes. For a while, it was the lighthouse used in the opening credits of the venerable soap opera Guiding Light. I never was good at origami and I can't imagine the daunting task of wanting to make 1000. Love how you tied everything together in this post. Beautiful! I would love to learn origami. Attempts on my own have not been successful... Maybe I was using the wrong type of paper. What an awesome crane! I love it! The crane makes a cool decoration. Yard art, eh? I remember that book. I did a story about the origami cranes a few years ago. Awesome creatures and an equally awesome story Mary. thank you. great shot!...i used to make crane origami and i enjoyed decorating my room with them in different colors. My daughter used to make paper cranes all the time. I still find them in the house sometimes. Beautiful shot of the crane. Loved the video. Mine is posted. Have a great day! 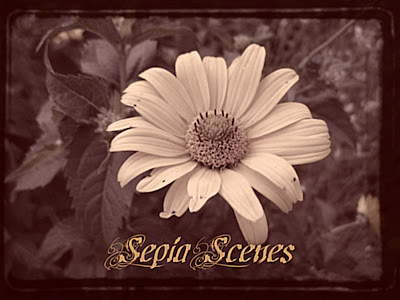 I like your photo for sepia scenes, but I love that header! It has been a while since I participated so it was new for me. The crane really looks very tall. Very interesting shot!